The 4th of July is less than two months away, and the Three Tree Point Fireworks Fund is putting the call our for business Sponsors to help raise money needed to continue this great local tradition. This display is enjoyed by many area residents, but it can’t be continued without donations – this is an all-volunteer non-profit organization that must raise $25,000 to keep this grand local tradition alive. To see the specific benefits your business will receive from each level, click here: http://3treepoint.org/sponsors. …to help fund the 2012 Three Tree Point Fireworks event! Although mostly funded by private donations, support from business leaders like you helps keep this great homegrown tradition alive. Our fireworks tradition reaches more than the affluent residents of Three Tree Point – neighbors from Normandy Park, Seahurst & surrounding areas participate – making it a perfect place to market your services. It’s also a great way to thank your customers for their patronage of your business throughout the year. Exposure to the eyeballs of this area’s most affluent residents. Grassroots marketing to your local customer base. Exclusive networking opportunities at our annual Neighborhood Donor Party on Saturday, June 30th. Your logo and link placed on the Three Tree Point Fireworks Fund website. For Silver Level and above, your logo, link and company mentioned on The B-Town Blog. Affiliated Facebook and Twitter promotions as well. Sponsoring the Three Tree Point Fireworks Fund is an excellent business decision that will enhance your relationship with the desirable consumers of Three Tree Point, Normandy Park, Seahurst and surrounding areas. We look forward to welcoming your generous support and helping promote your business! The Three Tree Point Fireworks celebration is supported entirely by donations from the communities of Three Tree Point, Seahurst, Normandy Park, Seola Beach, Arroyo Beach, Arbor Heights and others. Our barge based, high-altitude fireworks show has gotten better every year thanks to countless people who have donated time and money. 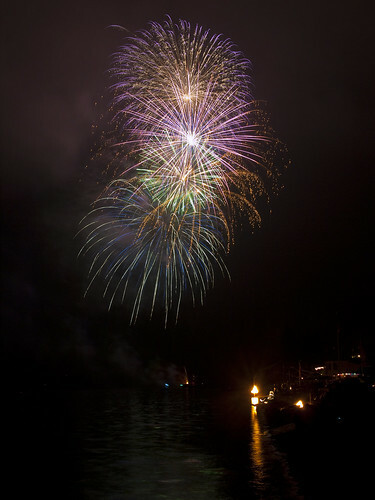 In 2012, our goal is to keep the fireworks and community celebrations at the same great level that they have been at. This will be the fifth year we are seeking corporate sponsors for our event. We raise funds from May–June to ensure we have time to get all the permits, insurance and the best vendors. Originally started by the Miller family as a gift to The Three Tree Point Community, the fireworks tradition was continued by neighbors when the Millers moved away. In addition to the fireworks, the neighborhood traditions of a community pancake breakfast, kids games, flag raising with awards, bike parade and more have been ushering in summer at our great community. What a great place to live! Officlal Three Tree Point Fireworks Fund website. Be sure to “Like” the 3 Tree Point Fireworks Fund Facebook Page here. Follow 3TPFireworks on Twitter here. NOTE: Online donations for residents wishing to help out will be active very soon – look for a separate post shortly!